Ch. Pouch Cove Caribé, "Caribe"
Owned by Charles White and Cathy Cates of Houston, TX, Caribe is an exceptional PWD bred by the famed Pouch Cove PWDs kennel. Well-muscled, with good bone and an impressive head, he's done extremely well in the show ring. 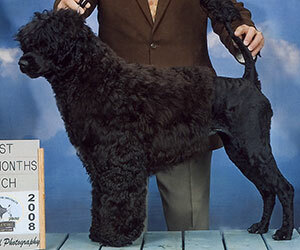 Conformation accomplishments include Winner's Dog at the 2009 PWDCA National Specialty, as well as Best Puppy in Sweeps; followed by multiple Best of Breed wins. Caribe is also an enthusiastic working dog, with multiple performance titles to his credit. Ch. 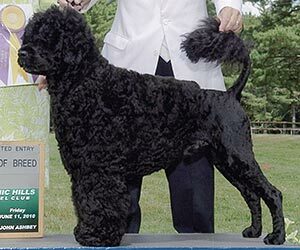 Cartmel Sea Master, "Carlo"
Am Can Ch. Pouch Cove's Stand and Deliver, "Stanley"
Ch. Raffles Plainly Pouch Cove, "Jane"
See the pedigree and puppy photos.